My first experience with the raw food diet was a 4 day weekend with the girls and Carol Alt's book "Eating In The Raw." Carol Alt is known as a supermodel, but she also is a raw food proponent and author. Carol Alt is 5'10”, weighs 125 pounds and eats all the raw food she wants. Her story is a common one in that she abused her body through a very unhealthy model diet. She attributes her recovery to Timothy Brantley who coached her on a raw food diet that she claims helped her regain her energy and vitality. Please be aware The Carol Alt Raw Food Diet is NOT Vegan. Carol's raw food diet plan is perhaps, the most all-embracing of raw food diets. Most of those who follow a raw food diet plan are raw vegans, the Carol Alt raw food diet plan is not. While she uses nut cheese and nut milks, Carol Alt also embraces raw dairy products such as raw milk, raw cheese and even raw meat and fish. Since I do not advocate animal products, this is an area that I am not in agreement. I question the benefits and the concern of pathogens in raw meats and dairy which is why the common practice is to cook them. When Carol Alt started her raw diet plan, she enlisted the help of a naturopathic doctor, Timothy Brantley. This was a great help to her to make sure she was eating exactly what her body needed. It is always recommended to seek out a doctor or a nutritionist in your area to assist you with your own personal raw food diet plan. You want to do what is best for you not what others say. Many raw food enthusiasts regularly go for medical checkups to get blood tests to make sure that their raw lifestyle is fulfilling their own personal needs. I think it is a wise idea to get a regular physical checkup including blood tests to make sure that you do not have any nutritional deficiencies. 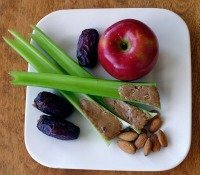 Even when eating raw foods exclusively, you may get into the habit of choosing foods that you enjoy they may not be totally balanced for your own personal unique nutritional needs. I was inspired by Carol Alt's book "Eating In The Raw several years ago as a newbie to the raw food diet. It was a quick read and it included several recipes that I tried and liked enough to explore finding more ways to add in raw foods. It does help to work with a knowledgeable coach and healthcare professional so that you can determine what works best for you. And lastly, my recommendation is to find quality, non GMO, organic foods to ensure that you are not consuming modified and chemically laden raw foods.